Like some other automakers, Chevrolet decided to make heated seats, heated mirrors and remote start standard on every trim level of the Equinox. Now that the redesigned 2018 Chevrolet Equinox is finally here, General Motors has to convince a public that’s already distracted by refreshed competing vehicles and successful rival ad campaigns to buy a vehicle that’s come late to the party. “There are pros and cons” to being the last to arrive, Longpré said. The Honda CR-V, Toyota RAV4 and Nissan Rogue are the Equinox’s stiffest competition in the segment. All of them have been refreshed or redesigned and the Rogue is coming off a successful ad campaign that saw it partner with the Star Wars franchise and the film Rogue One. Through the first four months of 2017, all four vehicles have shown increased sales with the Equinox leading the way, up 53.4 per cent over the same time last year. The Rogue was up 31.6 per cent; the CR-V up 17.0 per cent; and the RAV4 up 2.2 per cent. “There is a lot of good product on the market. But for us, the one thing we really wanted to do is provide a vehicle for Canadians,” Longpré said. So like some other automakers, Chevrolet decided to make heated seats, heated mirrors and remote start standard on every trim level. “We are trying to connect with Canadians more than ever now,” Longpré said. Even the TV and online video ad campaign is entitled “The Canadian Dream.” It features Canadians indoors and out. There is a lot of nature, a few hockey shots and plenty of snow as the automaker targets buyers between the ages of 30 and 50. Unlike the U.S., where there is an additional barebones base L model, the Equinox is available to Canadians in only three trim levels: The LS, LT and Premier. The LT and Premier will offer value-priced Comfort and Convenience or True North packages. There aren’t a lot of optional packages to choose from as the automaker is trying to keep it simple. The base LS front-wheel-drive model will list for $26,995, destination charges included. It will have standard amenities such as Apple CarPlay and Android Auto, push-button start, backup camera and 17-inch aluminum wheels. Chevy will also offer a discount of up to $1,975 while 2018 models remain available for sale. It’s an effort to entice buyers who have already been able to test drive the revamped competition for a while now. Longpré called the discount and pricing “part of the strategy but not the only strategy” when it comes to marketing. “Three engines is a key differentiation for us,” he said. The Equinox offers a 1.5-litre turbo six-speed automatic; a 2.0-litre turbo nine-speed automatic; and a 1.6-litre diesel six-speed automatic. The diesel won’t be available until late summer or early fall; pricing for the 2.0-litre and diesel engines have yet to be announced. 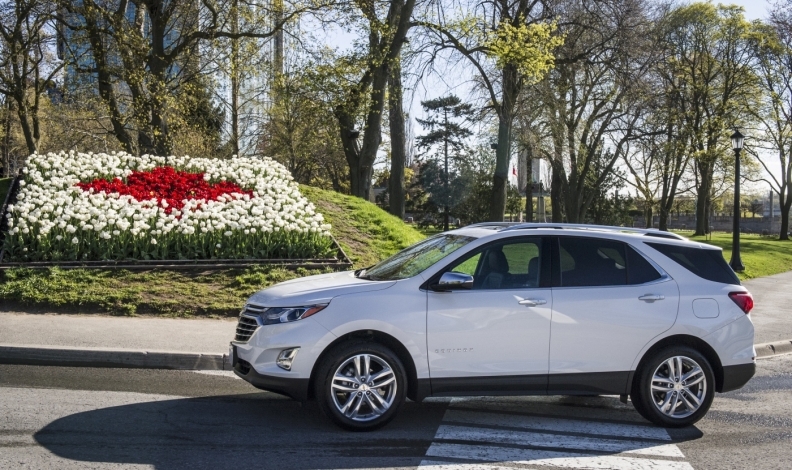 The Equinox is also a key product when it comes to Canadian manufacturing. It’s assembled at the CAMI plant in Ingersoll, Ont., getting its parts from a number of suppliers in the region. But because GM is moving production of the Terrain from CAMI to Mexico, about 600 people will be laid off as the plant will now only make the Equinox. Mathew Palmer, GM Canada’s director of communications, said it’s hard to say what the future of the CAMI plant is going to be.